Not many photographs exist of the original War Memorial (Cof Golofn) in Nefyn. I suspect this was due to reverence for the dead and the deep respect the local people had for the Nefyn young men who perished during the Great War. It was a place where relatives grieved for their loved ones and photographing the memorial was viewed as being very disrespectful. I have come across just one photograph of the original memorial and it is shown below. 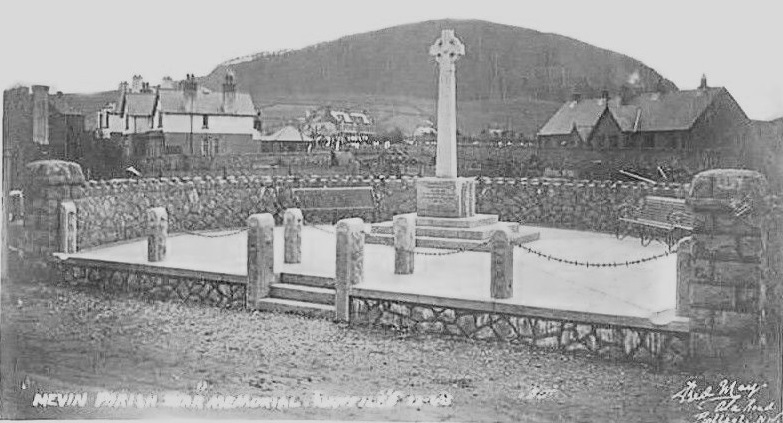 It is a postcard photograph taken by Fred May, a professional photographer from Ala Road, Pwllheli, when the Nefyn Parish War Memorial was unveiled on February 23, 1923. The memorial was much larger than it is today. It occupied an area of approximately 750 sq ft in the middle of the Nefyn to Morfa Nefyn Road and by a side road later named Rhodfa’r Mor. The memorial site was elevated about two feet above the road and it was semicircular in shape with a capped granite wall along its outer edge. The stepped entrance was at the open, north-facing-end of the semicircle where there were also eight, three feet tall granite columns interconnected appropriately with spiked link chains. The memorial itself, the Celtic Cross and the Plinth on which it stood, were centrally located within the semicircular area. There were two metal benches for visitors to sit along the inner wall and both benches were focused on the memorial. The wall provided grieving families and friends with a little privacy. There were columns outside the wall on the Nefyn side as shown on the extreme left of the photo. The Nanhoron Arms Hotel and Dolwen are also visible on the left and the Nefyn School building is on the right with Garn Bodfean in the background. The Church Hall had not yet been built beyond the road on the south side of the memorial. The Celtic Cross faced North-South and attendees at the annual Remembrance Day ceremonies congregated at the open end. During the planning phase in 1922, there were heated discussions in Nefyn and within the War Memorial Committee on whether the names of the deceased men should be recessed into the granite Plinth. The primary issue was cost. The public meetings were overwhelmingly in favour of inscribing the names and the vocal majority succeeded in their endeavour. After all, a total of thirty-three young men from the Nefyn area had lost their lives during the conflict. The names of all nineteen sailors and fourteen soldiers were memorialised into the granite on the Plinth. Traffic around the memorial was not an issue in the early 1920’s. There were horse and carts, bicycles, an occasional omnibus and very few motorcars passing by. As the years moved on though, the car traffic started increasing especially after the Church Hall and the garage were built on the south side of the road. Then there was the onset of World War II with the Nefyn to Morfa Road patrolled by Army trucks of the Royal Welch Fusiliers and Crosville running regular bus service. The safety of children walking to the Primary School was also a source of concern. It was becoming obvious the large War Memorial was an impediment that had to be made smaller. It was a difficult decision for the older generation. I am not certain when it all happened but the elevated area and the surrounding wall were removed and the memorial site reduced to a rectangular area of around 180 sq ft. The site was also moved several feet towards Nefyn. The extra space allowed pavements to be built in front of Rhianfa and Egryn on the north side and in front of the Church Hall on the south side. Cars could park along the edge of the pavements and still provide sufficient room for traffic to move smoothly in both directions. The shift in the position of the memorial made access to Rhodfa’r Mor much easier for traffic coming from Nefyn. The smaller War Memorial continued to include most of its earlier features. The Celtic Cross and the Plinth, the two metal benches and the eight granite columns and the spiked link chain remained. The metal benches however did not face the memorial anymore but faced the roads on either side. More significantly perhaps, the Celtic Cross and the Plinth were rotated 90 degrees clockwise, so the Celtic Cross now faced East-West, in full view of the traffic moving along the Nefyn to Morfa Road. The removed granite material apparently was used to construct the wall in front of the Church Hall. The names of the sixteen Nefyn men who perished in WWII were added to the War Memorial at the end of the War. The names of those twelve sailors and four soldiers however did not fare as well on the memorial as the names of their WWI counterparts. Their names were inscribed on a brass plate and the plate attached to the side of the Plinth. The weather has taken its toll on the plate and the names of the men are rapidly fading into obscurity. The second photograph is a view of the same scene taken by photographer Eric Jones just before the old Church Hall was demolished in 2007. Comparing the two photographs the difference in size, the rotation of the memorial, and the shift in its position are obvious. Based on the coordinates of Garn Bodfean in the background and the Nefyn School building just visible on the right, Eric took the photo close to the same spot where Fred May took the postcard photograph of the original Nefyn Parish War Memorial ninety two years ago. The original Nevin Parish War Memorial unveiled on February 23, 1923. 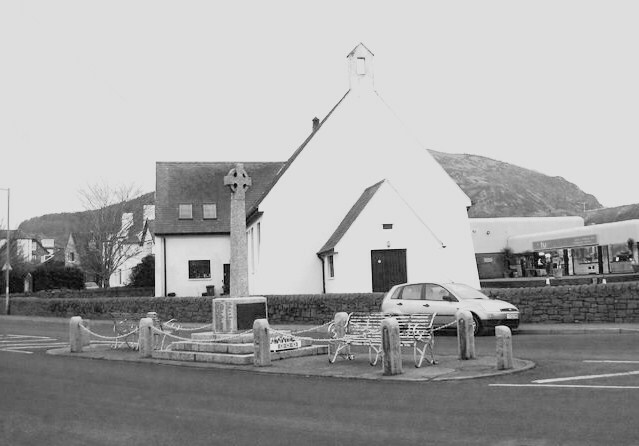 The Nefyn War Memorial in 2007 with the Old Church Hall in the background. Courtesy of Eric Jones.